Vacation Rental Script where it helps to search accommodation rooms in online. Advance Vacation Rental is an online script to reserve the accommodation needs. With the help of the script tourist or holiday, trips will make booking accommodation rooms easier.With our script, the user can enjoy more features like preferred city area, Check in, check out, amenities, price, photos, Number of guests and most popular host. The main thing in our script is that all the features that user can offer at an affordable price.Hospitality service Vacation Rental Script is mainly targeted on the traveler who loves to explore the world. Based on our Vacation Rental Booking Website Script the user can able to get the best hotel with more comprising another list of hotel rooms. In our script it is fully customized code it will help the market to increase your business standards to the next level. 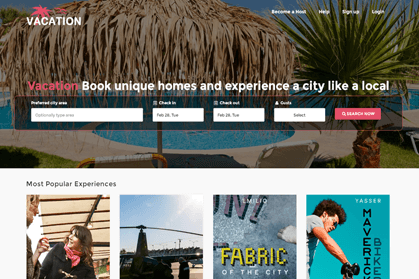 Vacation Rental Booking Website Script is full response user-friendly attractive UI with an impeccable advance feature than another script in the market. We are high providing the custom Vacation Rental Script for Vacation rent also to make the traveler enjoy the travel with more fun and surprise. It is one of the based platforms for creating the small scale industries to achieve bigger things. With the help of the features, the user can able to list the different price of hostel rooms.Along with the map integration the user can able to view the different location of the hotel rooms, this will help the user to find the nearest location of Innovative unique home sharing rooms in the traveling. The user views the different rates on the hotel, based on that the user can able to get the clean idea of choosing the best room for the minimum price. Tourism based Vacation Rental Script with the check-in and checkout time and a number of the member it helps increase the probability of getting the nice rooms. Our Property Rental Script will automatically give pricing terms as the host has the ability to set daily/nightly, weekly, monthly prices. On our script, the mode of payment they can be done by best payment gateway integration in the script (PayPal). Vacation Rental Script will also provide the additional features like hotel safety rules, availability times of staffs, contact details and social integration which help to let the friends know about the site and hotel. Finally I landed up at the right place to purchase a good neat script like this. This script is at affordable cost and beneficial too. The admin is powerful and helped me for the customization purpose. Now I can do all the modification based on my interest. I am thankful to the team. If anyone looking for abirbnb clone script I strongly recommended for PHP Scripts Mall. The employers are friendly, knowledgeable, and dedicated to providing a high quality technical supports.